Well today’s cocktail is a tasty creation that is visually disturbing. Very dark green with a foamy top, and a little bloody grenadine doesn’t make it all that appealing (although it does match the name). Good thing the taste delivers and then some! The “Nordic Death” features a tropical berry flavor with a light sparkle. It has a mild alcohol(y) taste on the finish. 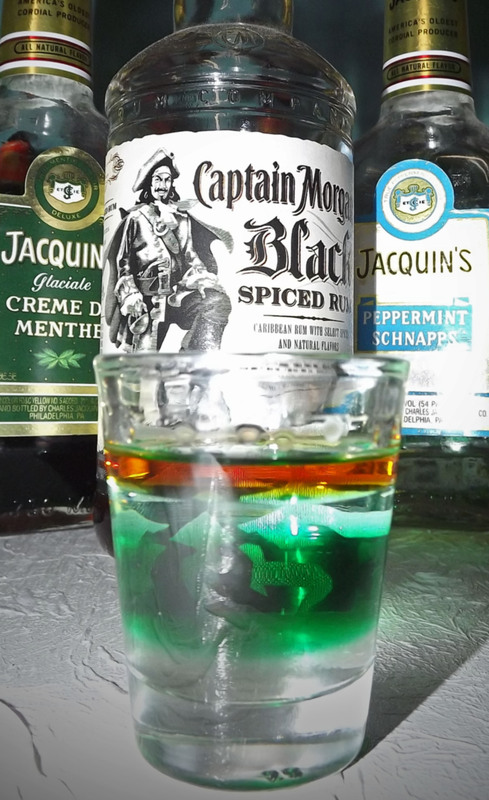 I’d call this a great party drink, especially in the creation side of the presentation. Shake vodka, liqueurs, and pineapple juice. Strain into an iced Collins glass. 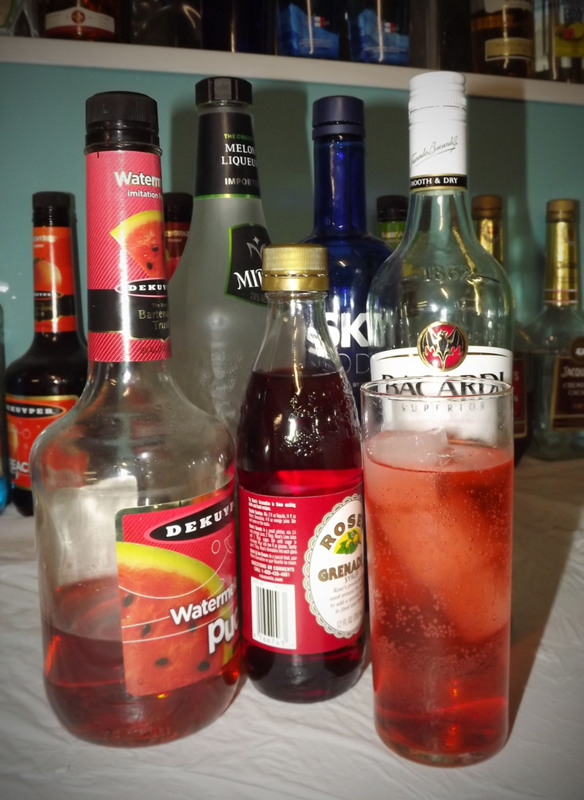 Top with sprite and dash grenadine on top. Today’s late night cocktail is a mildly aromatic and powerful drink. The Vodka Grand is bold both in appearance and taste. Strong and mildly sour you get a semi-sweet citrus start, then to a mid-range Grand Marnier on your main palette, finalized by the familiar sting of vodka. This drink is certainly a slow sipper, with a flavorful bite. Don’t take it lightly, but instead enjoy it’s tasty elegance. Stir and Strain into a chilled cocktail glass. Garnish by floating an orange slice in the drink. I’ll be the first to admit that a shot isn’t really a solo drink. In fact it’s not one that is even a “smart” choice on most occasions. However, the art of layering a shot really fascinates me. Specific gravity of different alcohols cause the higher percentages to float over more sugary and dense liquids. I modeled the Black and Mint after both taste and a strong visual component. The drink starts with a hard bite, rolls into a powerful refreshing mint, and drops off with a sweet finish. 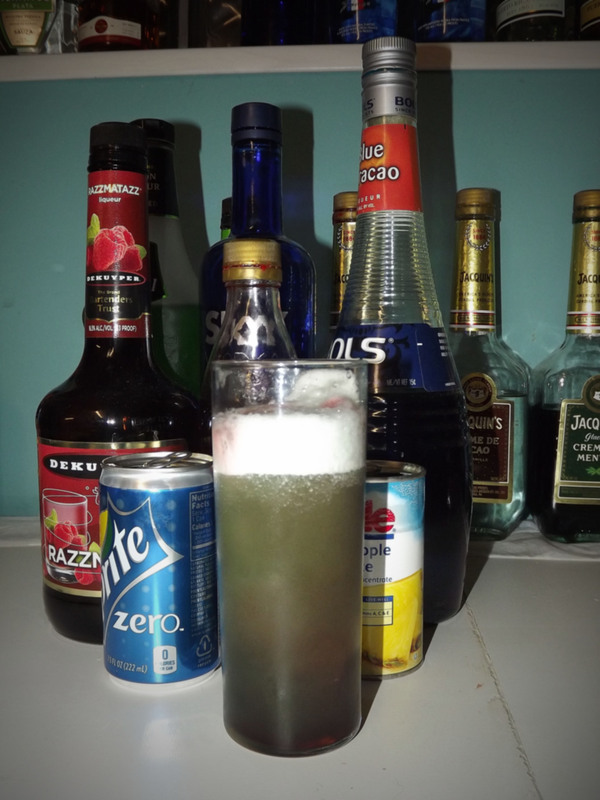 Shake and strain into a pint or Collins glass, top with sprite. With it’s citrusy aroma, and brilliant blue color you know this one is a catch! Ok so nautical puns aside this is an interesting and powerful drink. The Blue Marlin Cocktail features a sugar rim and feels very tropical. Unfortunately the taste doesn’t quite come up to par with the classy appearance. I feel the drink is very lacking in a more well rounded taste palette. Of course I do prefer sweeter drinks, so it might just be me. That being said the addition of the sugar rim, really helps make the drink manageable. It’s not very sweet in the first place, so having that extra bit on your lips redeems the cocktail a bit. 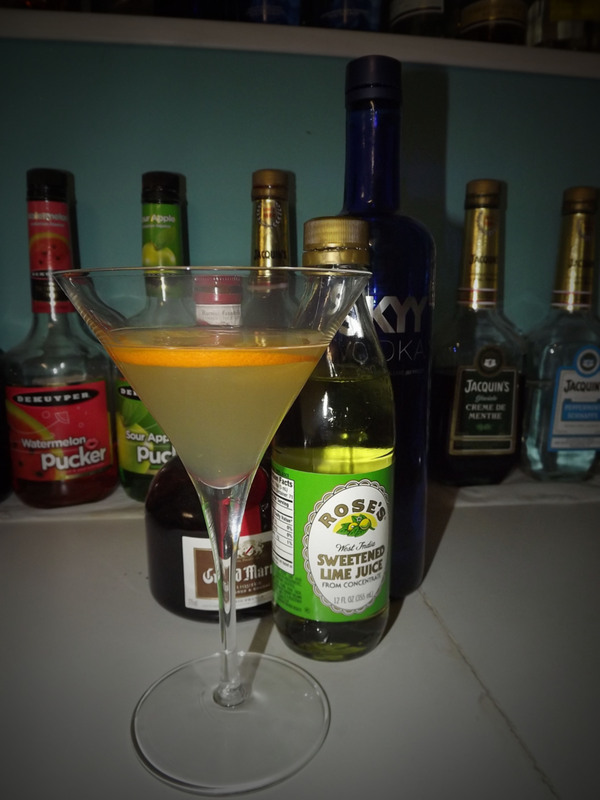 Also I did need to substitute a little citron vodka into the mix which may have thrown things off a little bit. 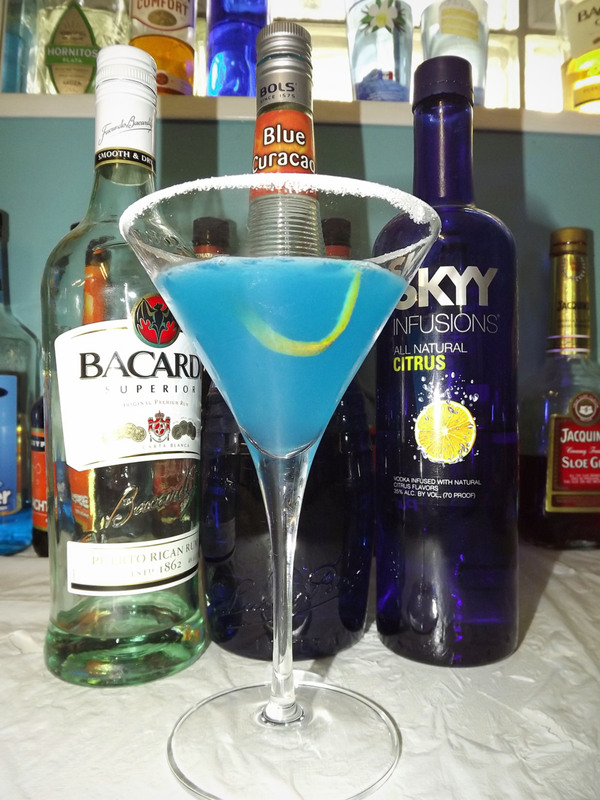 Either way the Blue Marlin is a great drink in terms of presentation, but the taste isn’t for everyone. Rum lemon wedge around edge and rim with sugar. Shake and strain rum, curacao, and sweet/sour with ice. Strain into prepared cocktail glass. Garnish with Orange Twist.